Kitchen is that corner of my house that makes me happy….always. This feeling not just comes from my culinary adventures and the praises I’m showered with, but also from knowing a few tips or rules of thumb which make my life easier. These are the tips which really come handy and are guaranteed to take you a notch higher than your culinary rivals. I have incorporated a whole lot of them to make your life easier too. Some of them are inherited from my mommy, some from my friends and relatives and few I found while flipping through some magazines. Life in kitchen will never be the same after this. So get smart! Get cooking!!! Fruits other than berries shouldn’t be stored in the fridge, unless you are keeping them for a long time. Their flavour gets dulled in the fridge and apples actually make other perishable items ripen (go bad) faster. To remove the skin of almonds easily, soak them in hot water for 15-20 minutes. Putting 3-4 cloves in sugar container will keep the ants at bay. If you keep a piece of blotting paper at the bottom of the container, it will keep biscuits fresh for a longer time. For peeling ginger, rather than using a paring knife or vegetable peeler, reach for the spoon. Scrape it against the skin and it’ll come right off, following every contour and minimizing waste. Freeze wine in ice cube trays and stores them in the freezer, ready to be pulled out one at a time and added to pan sauces and stews, saving you from having to open a whole bottle every time a recipe calls for some wine. The fastest way to defrost meat is under a cold running tap. But if you want to save water, use an aluminium tray which is a good conductor of heat. You can cut the defrosting time by 30 percent this way. It also works on soups, stews and anything that is is frozen flat. Keep your onions in the refrigerator. A chilled onion is easier to chop, and causes fewer tears. However, do not keep the peeled or cut onions in fridge. They attract lot of microorganisms which can poison the rest of your food. Want to boost the antioxidant power of your green tea? Add some lemon to it. This also helps reducing your waist line. Apply some lemon juice on the cut surface of the apple to avoid browning. They will look fresh for a longer time. To reduce bitterness of karela or bittergourd, slit them into halves, rub salt and leave them for 30 mins before washing. Use a wooden board to chop. It will not blunt the knife. Don’t use a plastic board, small plastic pieces may go with the vegetables. Marinate meat/chicken in a zip-lock bag. This way the marinade is applied equally, without having to mess your hands or utensils. Buy pre-peeled garlic to save the peeling time. There are many marts and grocery shops which sell these. This garlic is fresh and also lasts long in the fridge. Do not throw the cheese that is left over and gets hard after few days. It can be used intense flavor to broths, soups, and stews by adding it to the simmering liquid. Put a dash of cinnamon or cardamom to your tea for that extra rich flavour. After using cardamom seeds, do not throw the covers. These can be preserved along with your tea powder and added while making tea. It will give an additional aroma and flavour to the tea. Don’t want to let the onions make you cry while cutting? cut them into half and hold them under running water for few seconds. Do this even after you peel them. You can extend the lifespan of herbs and leafy veggies by several days by rolling them up in a newspaper or spare paper towels and placing them in zip-lock bags with the seals left slightly open. Unsure of your eggs freshness? Place them in a bowl of cold water. Fresh eggs sink. Bad ones float. When you break an egg, some pieces of the shell often get into the egg which are very stubborn to remove. The solution is the egg-shell itself. It acts like a magnet to remove the stubborn pieces. Always keep the dough covered with a moist cloth. This prevents the dough from drying and catching dust. Want to check if the watermelon is ripe? Knock on a watermelon to check for signs of hollowness. If it sounds hollow, its ripe. If it doesn’t, it’s unripe. To prevent butter from burning in a hot pan, add a tablespoon of oil to it. 3 ways to peel a garlic with ease – 1. keep them in water for a while. 2. give them a little whack, so they open and peeling becomes easy. 3. slightly warm them up before peeling. To keep chillies fresh for a longer time, remove the stems before storing. Have got this trick from my daddy dearest. Want to cut a cheesecake and want the knife to come out clean? Dip the knife in warm water and wipe it with a towel before cutting or cut the cake with a wet knife. Place a betel (paan) leaf over the leftover idli and dosa batter to prevent them from becoming sour. Over-ripe bananas never find their way to your tummy. But this is their most nutritious form. Easy to digest and good for heart. For a peaceful night’s sleep, have a banana an hour before going to bed. Avoid seperating bananas until you plan to eat them. They spoil less when they are in a bunch. Eat fruits empty-stomach for best results. They are sure to bring a flow on your face. Do not throw the lemon rind after squeezing the juice. This can be used while scrubbing oily pans. Grind some common salt in your mixer/grinder for some time every month. This will keep your mixer blades sharp. A small ball of tamarind can also be used while scrubbing the stubborn oily pans. It is also an excellent polish for brass and copper items. Don’t want honey to stick to the spoon? Rub a little oil on the spoon before dipping it in honey. Adding half of teaspoon of sodium bicarbonate in the milk while boiling will not spoil the milk even if you don`t put it in the fridge. Watch from the oven window to conserve energy because the oven temperature drops by 25 degrees every time its door is opened. Add a tablespoon of butter or oil to a pot of boiling pasta. This will prevent the pasta from sticking. An empty bottle is a best substitute for a rolling pin. If your meat/chicken curry is too salty or spicy, don’t panic. Adding a little bit of boiled and mashed potato to it will save your day. Make a paste of a tablespoon of flour with little water will thicken any liquid. Don’t add the flour directly to avoid lumps. 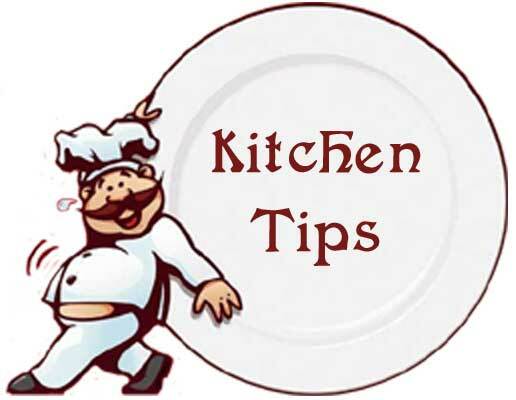 To keep paneer fresh for several days, wrap it in a blotting paper while storing in the refrigerator. Brush beaten egg white over pie crust before baking for a golden, glossy finish. To bake potatoes quickly, place them in salt water for 15 minutes before baking. Use the skin of boiled potatoes to wipe mirrors to sparkling clean. To peel a clove of garlic, set it on a cutting board and smash it with the flat side of a big knife. The papery skin will come right off. Keep a seperate cutting boards for cutting fruits, cheeses and other things that you’d prefer didn’t absorb the odors of previous meals. Try to use spices as soon as possible. Dont over-stock them. Spices go off quickly, and when their color starts to dull they’ve lost a lot of their flavor. Add few drops of lemon juice in the water before boiling the rice to make rice whiter. Put a small packet of boric powder in the container of rice to keep insects at bay. Also you can put few leaves of mint or a bay leaf in the container of rice and flour to keep insects away. Frozen peas don’t need to be cooked, just thawed, so they can be thrown into a dish at the last minute. Or make a salad by running under warm water in a strainer, dress and you’re done. Small onions or shallots are more subtle and flavorsome than their larger counterparts. Large and stiff onions can be used in roast and soups. But most of the recipes are improved by small onions with their subtle flavours. Put 2-3 cloves in sugar to keep ants at bay. Place overripe tomatoes in cold water and add some salt. Overnight they will become firm and fresh. Line the bottom of your refrigerator veggie drawer with paper towels. These will absorb the excess moisture that causes veggies to rot. If you need only a few drops of lemon juice, avoid cutting the lemon into half. Instead puncture it with a clean skewer and squeeze the amount of juice you want. Prevent mushrooms from getting slimy by wrapping them in paper towel before refrigerating. Store crispy and chewy cookies in seperate air-tight containers. Storing them together will make the moisture from the chewy cookies make the crispy ones lose their crunch. Spatulas are awesome for anything that needs to be flipped or scraped, like eggs and pancakes. For everything else, tongs are the way to go. They’re much more nimble and less awkward to use, and you’ll find far fewer things jumping from your pan onto the floor. Put rice in your salt-shaker to prevent salt from hardening. Rice absorbs moisture that can cause clumps. Believe it or not, but honey and joggery are the only non-perishable items in your kitchen. So dont get rid of it even if the honey gets crystallized or cloudy. Warm it a bit and you are good to go. Don’t discard the water in which the vegetables are soaked or cooked. Use it in making soup or gravy. Chop the vegetables only when you are ready to use them. Don`t cut them in too advance. It would spoil their food value. If you drop an egg on the floor, cover it with salt and let it remain like this for a couple of minutes. You will be able to easily clean the mess with a paper towel. Stash the extra cooked pasta in a zip-lock bag and refrigerate, This prevents the pasta from hardening. When ready to reuse, put the pasta in boiling water for few minutes to restore moisture. Before baking a cake, always get all the ingredients at room temperature. You can eliminate tedious cleaning of the shelves of your kitchen cabinets if you line them with old newspapers. Just discard and replace with fresh ones. Put cut or grated potatoes in cold water to prevent them from getting discoloured. Use a wooden spatula for dishes that need a lot of stirring. This will prevent scratching of utensils. Besides it will be easier on the hands too. Do not throw the crust removed from bread for making sandwiches etc. This can be dried and powdered in a mixer to form fine breadcrumbs. Refrigerate and use as and when required. Avoid cooking sour dishes (like tamarind based dishes) in a non-stick pan as the sourness will remove coating faster. While cooking in a non-stick pan or a light-bottomed pan, place a griddle or tawa underneath. This will prevent the dishes from burning. Minimize kitchen miles. So much time can be wasted walking about. Don’t keep trotting over to the bin. Keep a bowl next to you for veg scraps, peelings etc. so that you throw all of them together in the bin.